Painting with the 2 Pros! Recently I upgraded from the iPad 3 (first Retina iPad 2012) to a new 10.5" iPad Pro with the Apple Pencil, with the intention of enjoying a much more responsive iPad, as well as the advantages offered by the new Apple Pencil. Procreate, birthed by James Cuda and wife Alanna, along with computer programmer Lloyd Bottomley and graphic designer Cameron Newton from a bedroom office in Hobart, has become the go-to app for digital painting and sketching, and has legions of illustrators and painters putting down their brushes and picking up their iPads and Apple pencils, including this newspaper’s very talented Eric Lobbecke and former Fairfax cartoonist and painter of stunning Sydneyscapes, Rocco Fazzari. The program has really been a hit worldwide and has challenged the likes of Adobe Illustrator, Photoshop and Corel Painter, the more traditional computer-based apps for creative design, drawing and painting. The iPad Pro, now with the introduction of the Apple Pencil, has also presented a serious challenge to the tablet makers like Wacom, as the iPad Pro offers a very convenient, flexible and powerful stylus / tablet alternative. It was a no brainer that I would like the Apple Pencil. Its made by Apple; it was expensive ($150) and so must be good! Ha! I was surprised though, how easy it was to use, and soon as I discovered Procreate (and at such a good price) I knew the combination was going to be a winner. There are many things that make working on the iPad Pro fun and easy, but I really love the way you can easily orientate the 'paper' on the screen to accommodate your natural sketching or painting style. Also the easy use of gestures and combination of pencil and fingers to manipulate the drawing base, colour and brush controls make it light, natural and intuitive. This doesn't mean its easy to create a masterpiece without some drawing and design skills. So I set about trying to create something worth keeping, while learning to handle the new software and digital pencil. So straight to YouTube for some drawing and painting lessons using Procreate. 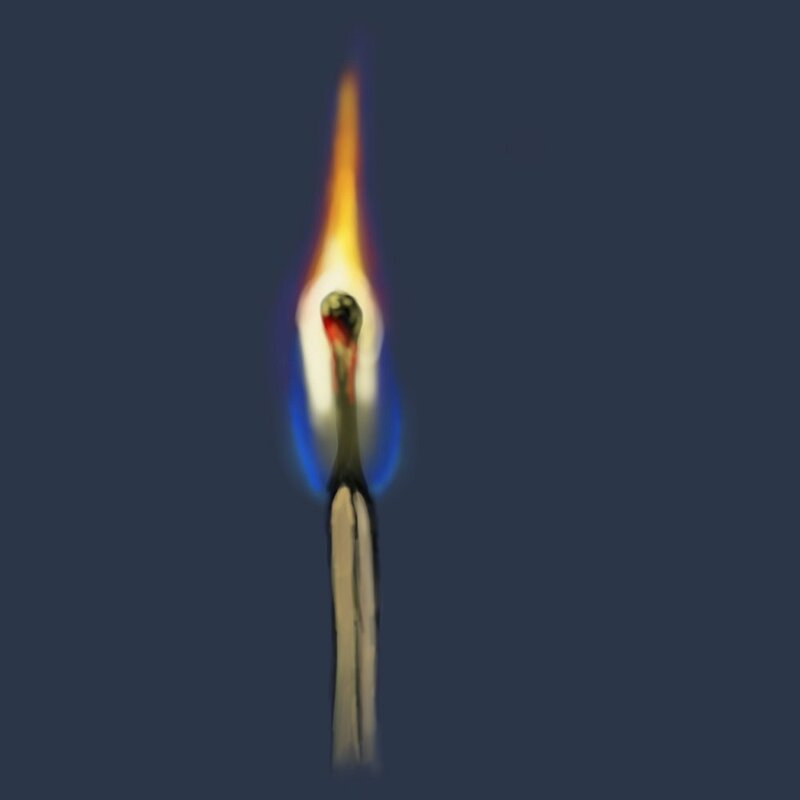 How to draw a flame! After spending a bit of time exploring techniques with the brushes and layers etc, and seeing what artists can do with this program on YouTube, I soon began to appreciate what a great program Procreate is, and felt a sense of pride that an Aussie team was behind it. 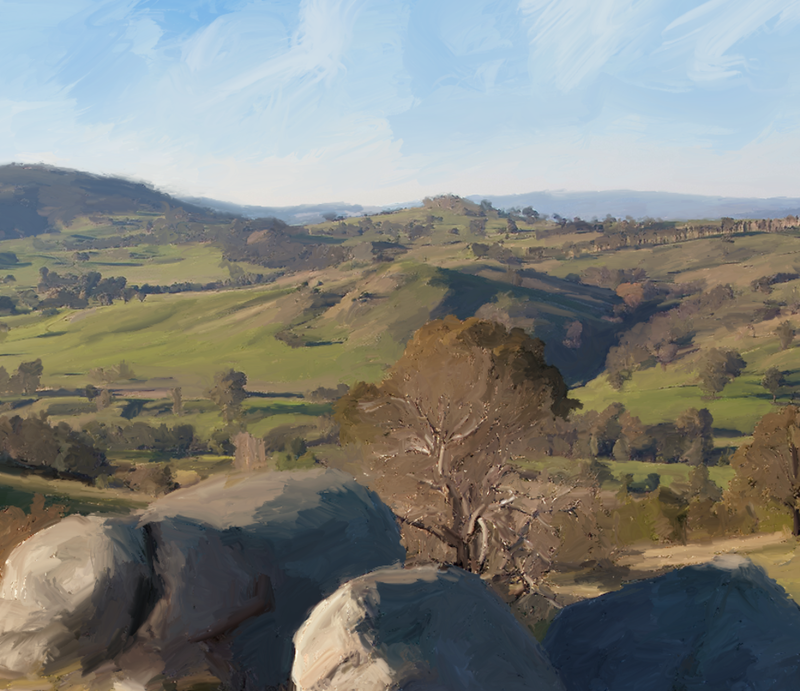 When Apple released iOS11 the Procreate Team came out with Version 4, a major enhancement to many of the features available in this app, not least the brushes used for painting. So straight into it. Select the blur tool and the oil paint brush, a suitable photo to clone and we have a painting! Essentially I had replaced the cloning tool in Corel Painter on the Mac and the Wacom tablet with the iPad. The new brushes in Procreate 4 as pretty amazing, whether using a straight application of paint or using the blur tool to pick up the colour from a photo and spread it like oil paint. And some stats on the painting - these are interesting.. It only took 9848 strokes to complete this painting in 3 hours and 38 minutes! As Real Estate photography has now become the principal income for Mac-Access, there became a need to 'pull in the windows' of some of the photos taken for real estate sales. Seeing HDR techniques cannot handle the extreme contrasts in light that you often find while taking photos indoors, I had to turn to adding artificial light to some inside shots. Usually the ones requiring a good outdoor view to be seen from indoors. Often the selling point of a home with great views. With some assistance from You-tube and some inspiration from the RE photography taken in the suburbs of Kensington and Flemington, I went about the challenging process of trying to 'pull in the windows' or fill the windows of an indoor scene with an outdoor exposure. There are many ways you can do it with varied success. The bottom line is that to achieve the effect successfully it requires time for setting up flash gear, getting the lighting right and often time in Photoshop. Although this HDR provides a well exposed indoor scene, the outdoors is very much over exposed. Another image is taken with flash units off camera setup to expose the windows area, but the light reading is taken for the bright outside light. Then the separate images are combined in Photoshop to 'Pull in the windows'. Windows Pulled in after a session in Photoshop. You can now see the water of Lake Eildon through the windows. A few weeks ago my 5K iMac seemed to be running slowly while using Photoshop. The usual fix is to simply restart, refresh all systems and get back to the task. Not so this time. I heard the usual Mac chime on restart but that is far as it went. 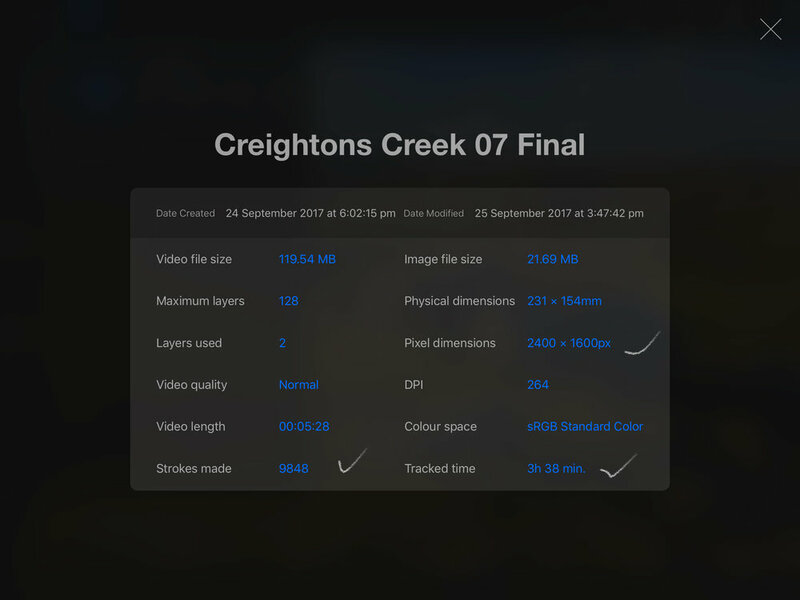 A black screen, a bright Apple logo and a grey progress bar with NO progress. This is what I was hoping to see, some progress, but just a grey bar. The boot process seemed to be halted somehow. Anyway to 'cut a short story long' (ha) I did all the tricks I have learnt over the years to get other people's Macs back up and running, but to no avail. It simply stalled every time on restart! Bummer! Now I had installed El Capitan OSX 10.11 a few days previously, so was it something to do with the new operating system? Call Mac Support by phone. As usual they are very helpful. But the only options they could come up with was to reinstall El Capitan and call back if it did not fix the issue. Fortunately when I did update to El Capitan I also made a bootable USB El Capitan installer thanks to the excellent advice from Dan Frakes at MacWorld. Using the USB drive I could re-install El Capitan in about 20 minutes instead of hours it would take downloading the software from Apple. Unfortunately, even with a new OSX, the iMac still would not boot. After getting back to Apple support, they advised the only option was to erase the hard drive and do a clean install. Of course they double checked with me that I had a full backup. Thanks Time Machine. After a full erase of the HD and re- install of data, the iMac still did not boot. Advice was then to take the iMac to the Apple dealer to check the hardware. This took a couple of weeks after dropping it off at Data Parts in Shepparton. After another erase and re-install of El Capitan without my data, the computer booted as normal. Conclusion; the computer was fine but there is a problem with the software. The technician worked on the idea that an installed app was the culprit. He removed a few of the apps that analyse the system such as iStat Menus 5 and CleanMyMac 3. He spent a lot of time working on the issue and finally rang me saying he had solved the issue by removing some apps. I was very pleased with the news but on returning home and starting up the Mac, it would not boot. Back to square one! I was charged a reasonably low fee for the work that was done, as it was not covered by AppleCare being a 3rd Party software issue. Seeing I was able to re-install the OSX via USB and get one go at working on the Mac, I decided not to send it back to the Apple dealer but work on it myself. I removed lots of apps only to find the same issue every time I restarted. A full weekend working on the Mac and getting nowhere. I must have re-installed OSX El Capitan 20 times, removed apps and every time it would not boot. It was worth a try even though I don't often solve problems using Terminal. It worked! The iMac booted. The grey progress bar light up with a bright advancing bar. Yeah. It looked much more promising. I was not game to reboot but went to bed feeling much better about the full weekend trying to solve this problem. Next morning all was well. It was not a dream after all! The iMac booted up as normal and with the Time Machine backup all my files and settings etc were there up and running. So one line of code, removed using Terminal fixed the problem. Wow, if only I knew this a couple of weeks ago. It would have been so simple. Indicating the termination of the boot process. Apparently this is the offending code that was removed. Now there is software made by Eltima called SyncMate which I had not heard of before and therefore wonder how this kernel extension found itself on my Mac. I am not sure if the problem was related to the recent installation of El Capitan but I doubt it. All is well now. Its lovely to see the light bar appear when booting up! (Although still viewed with some nervousness). Its over 6 years since I became involved in Real Estate Photography and it has been an ongoing challenge to present properties in a way that will attract interest from buyers. One thing is clear, the agents comment on the increase in interest and numbers of inspections when the photos are done well. A recent trip to photograph a property during late afternoon/twilight at Tatong produced a good outcome for the vendors and their agent, but the timing of the trip had a big bearing on the outcome of the photos. I organised with the agent to visit on a sunny day and the owners said that the direct sunlight disappears about 2 pm. This presented us with the problem of catching the sun before 2pm and then returning about 4.30-6 pm for twilight shots. So we decided on a 4pm slot and miss the sunshine. Twilight presents the property in 'good light', so to speak, with the soft afternoon natural lighting, balancing with the warmer house lighting. All good for creating a mood that often comes at that time of day when you kick off the boots, have a wine and relax. The problem comes however at this time of day, the inside lighting, which normally only adds a soft warm touch to the rooms begin to dominate, creating a yellow cast against a very blue or purple window light. In the brighter part of the day the rooms are normally lit by natural light from outside. The effect is a good balance of 'normal' room and furniture colours with a hint of softness from the inside lights. Here the inside lights in the kitchen tend to dominate the scene even though there is ample opportunity for the natural daylight to shine in. However at 5pm on a June evening in Victoria, the outside light is waning. Bathrooms often include heat lights which are very bright but usually override any other light sources with a strong orange cast. A way to represent more accurate colour in the bathroom is to switch the camera white balance to 'incandescent'. By the way here is an agent's view of the same bathroom without much consideration of lighting or compostion. Well time has arrived to update the Mac-Access Website to Squarespace Version 7. Currently I am Beta testing the next Mac operating system (OSX Yosemite) which is due to be released in October. Its the first time an OSX Beta has been released to the public since about 2000 by Apple. Its was an interesting exercise being part of this testing program (Apple asked 1 million volunteers to be involved.) Yosemite was first announced at the Apple WWDC in June and all indications it will be an impressive next step in the OS with many features making it work much better with iPhones and iPads. However although the Beta has been running nearly 100% successfully on my MacBook Pro its apprearance does not seem to generate much excitement when I show it to other Mac users. Maybe its real strength will emerge when it comes onstream and we can experiece it working togerther with iOS8. I like the new look and working with it. The Euroa Photographers planned a night at the local park to try some 'light painting' techniques. Mike planned the night and was armed with all the gear for lighting up the night sky. He did a bit of research on the activity and put in a practice night with his new Canon 6D a few nights before. With a bit of HDR treatment. Bringing those old Slides back to life! The prospect of scanning my slide collection (May 1972 - Sept 2000) at total of 8700 slides has always been rather daunting, but it has been something I wanted to do for a while now. So I did some research on the net and found some interesting sites and videos on Youtube which by-passed the two standard ways of achieving the task; using either a flat-bed scanner or dedicated film/slide scanner. There are many cheap and expensive versions of these devices and all are quite slow at the scanning process. I purchased a Canon slide scanner years ago and have used it to successfully scan selected slides. It takes about 2 minutes per slide and only accepts one slide at a time. Not ideal for scanning 394 boxes of slides. The research showed that there a quite a few people out there, like me, wishing to covert their slide collection into the digital form. With the advent of fully-featured, high resolution DSLR cameras, the idea of photographing the slides with a macro lens has become quite popular. Youtube Link. There are even a recent commercial solutions that uses the same concept called SlideSnap Pro and SlideSnap Lite (US$2195) but are quite expensive, especially to purchase and ship to Australia. So with my backup Canon 5D MkII, 100mm macro lens and a $70 slide projector from eBay I set to the task of making my own scanning (photographing) system. 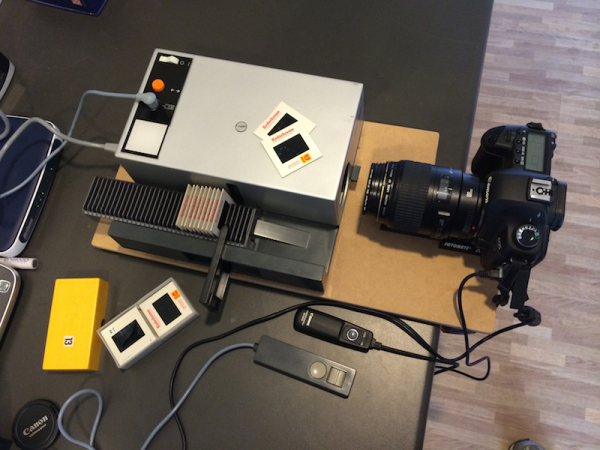 DIY Slide Scanner - A simple concept? I modified the lighting and lens system in the projector and now use it to store and move the slides in front of the camera in an orderly and quite precise fashion. To see the full story and how this was done you can go to my Slide Project page. Aerial view with cover removed. The Canon EF 100 f1:2.8 Macro will capture at 1:1 and therefore the image of the slide will match the sensor of the full frame Canon 5D. The setup with remotes for operating the projector and camera. A new photography group has started in Euroa and our first field trip was Wednesday 26th March at the Gooram Falls 18 km south east of Euroa on the Seven Creeks. Due to the misty and gloomy weather only 3 keen members attended. We were rewarded for our efforts with the light rain ceasing and the creek continuing to flow with a nice amount of relatively clear water. Mike and I met Janet below the carpark where we took a series of long exposures with our cameras on tripods. After using my iPhone 3GS for four and a half years it was time to upgrade to a new phone. There are many significant upgrades after 4 years of development, but I guess its the speed of the processor and the improved photographic features that really impress. 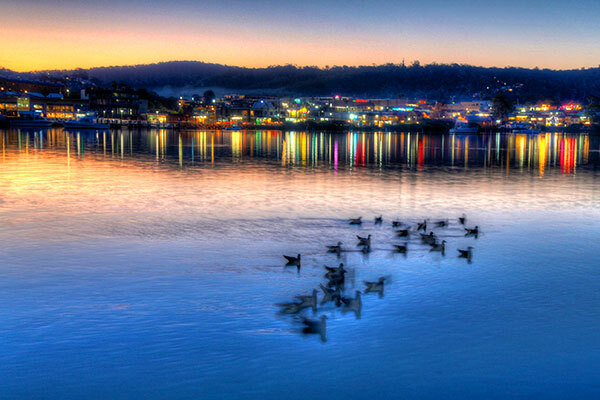 Here is a range of HDR images shot at Merimbula with movement of silver gulls added to the mix. This is not a HDR but an image produced from a visit to the Green Cape Lighthouse south of Eden. Not sure how much BHP Bulliton spent on developing their new logo but the team at Mac-Access have put in a day's work to come up with a new logo somewhat reminiscent of the old BHP logo and the Jony Ive's trend to flatten the design in iOS7. Out with the drop Shadows and Bevel & Emboss! There is an M in there and an upside down A as well as the Mac-Access colours. I was asked by Steve Tobin of Longwood to create a website for his creative metal sculpture business. After taking some photos of his work and the creator himself at Longwood, I got to work. And thanks to Squarespace, I had his site completed and ready to go live in a couple of days. Checkout Heavy Metal Art. Steve's work is amazing. This is the name for the photo exhibition to be held in Her Majesty's Theatre Ballarat as part of the Fringe Prorgram and Ballarat International Foto Biennale. Peter’s images blur the boundary between reality and illusion. He aims to accurately capture the full tonal detail found in Ballarat’s streetscapes, but also to challenge the viewer’s sense of reality, with his bold and creative HDR style. The images are created by combining a series of bracketed exposures into a single image taken during the transition between day and night. Peter’s exhibition is for people who want to rediscover the detail, colour and vibrancy of Ballarat’s urban landscape. I have been fortunate enough to have the oppotunity to photograph inside Her Majesty's Theatre with the aim to include some of these photos in the exhibition. You can see some of the HDR photos at Her Majesty's Ballarat HDR. Its great to see my friend Rick's website online after a lot of work from himself and his web-designer, Andreas. Rick has travelled extensively throughout Australia capturing his vision of our great landscape with his Hasselblad H4D50. The results are stunning as seen on his site: Aperture Priority. They are even better 'in the real' as I have seen them regularly roll off his large format Epson printer over the last couple of years. Rick prints and frames all his work and attention to detail and quality of materials used is second to none. Check out his limited edition series. All individual components and framing techniques used, whether Limited Edition or Open Edition prints, meet as a minimum requirement, Category 4 (Conservation) framing standards as defined by the PFGA - Picture Framing Guild of Australia. I caught Rick on my Canon with his Hasselblad at Two Peoples Bay, in WA last year. I have been fortunate enough to be accepted as an exhibitor in the Ballarat International Foto Biennale Fringe Program this year. I will be exhibiting a selection from my Ballarat HDR Collection in the Long Room at Her Majesty's Theatre. 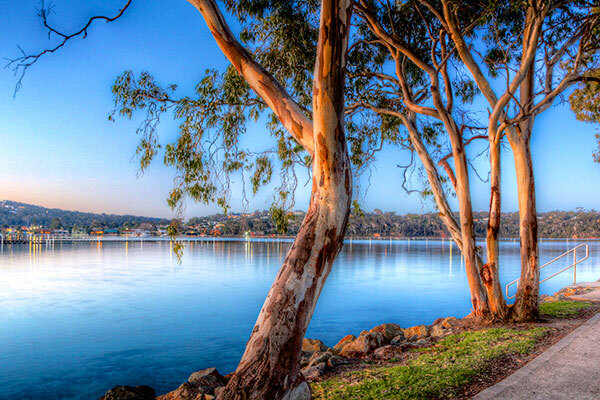 You can view some of these images in the Ballarat HDR Gallery on this site. Currently I am showing a 'Square Crop' selection from my last visit this month. Despite the digital HDR technique being somewhat at the 'cutting edge', it does reveal the texture and form in the Ballarat architecture that we often don't notice under normal lighting conditions. Also, since the images are taken at dusk or dawn, the ambient light is a mix of sunlight and electric sources of various colour temperatures. This can add a golden glow (from the sodium street lights) to the buildings, which contrast quite dramatically with the deepening blues and violets of the fading night sky. Look at the outside shots of the Gold Shop at the Mining Exchange and the building glows with gold. Cars are one of the biggest challenges when trying to photograph the historic precincts in Ballarat as they dominate all the parking spaces in front of the buildings. Dawn offers a chance to get some shots without too many parked cars. However there are still plenty buzzing around the streets adding light trails to the long exposures needed at this time of day. These can be a plus and a minus. I don't recommend standing in the middle of a street trying to get a good composition at that time of day in Ballarat. I even saw one car drive through red lights across Sturt Street at speed! And don't stand behind any cars with your tripod setup as they decide to back out! Graeme, the Theatre Manager at Her Majesty's has been very helpful, and has offered time for me to photograph inside the theatre itself. It will be a privilege to get this opportunity, but it will have its challenges as well. It will be difficult to photograph with a normal lens and all lighting is internal. The Long Room does offer a good opportunity to capture a mix of outside light, (including a glimpse of Craig's Hotel opposite) and the soft internal lights around the room. It will be an interesting day. Keep posted. Time for a new mini challenge. It was 2004 when I first published a CD sized calendar based on images around Euroa. Using a program called Corel Painter, I 'painted' over photographs on the computer with the aid of a Wacom graphics tablet and pressure stylus. 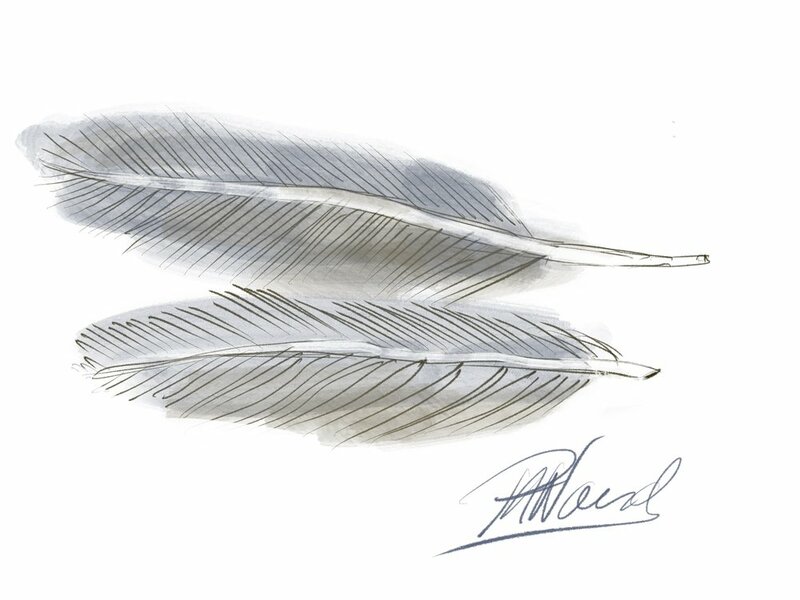 Recently I purchased a new version of the software, Painter 12, and was pleased to see it worked with the same Wacom tablet. I purchased some online training from the Virtual Training Company to better understand the software. Painter 12 is an amazing program that can digitally simulate all types of media and surfaces. You can begin with a white canvas and apply paint, pencil, crayon with a choice of over 700 different brush types. My preference is to use the Cloner brushes which pick up the colour from a photo which simulates the re-application of the colour with a brushed-on texture and feel. The results on screen always look better than the printed versions which lack the dynamic colour displayed on the back-lit monitor and the texture of a real oil painting. I experimented with running a roll of Inkjet Pro canvas through my Epson R3000 printer and found the results to be surprisingly good. Vibrant colour with the added texture of the canvas. My aim is to exhibit a number of these paintings at the HiArts Art Exhibition at Highlands (deep in the Strathbogies) in March. Craig's Hut (Man from Snowy River hut) Mt Stirling near Mansfield. I have been working in real estate as a photographer for nearly 4 years now and have learnt a lot in that time, thanks to my principal employer Di Andary at Perfect Choice Euroa. At about the time I began I was experimenting with High Dynamic Range (HDR) photography and found this technique very useful for taking indoor and twilight shots of properties for sale. As I will demonstrate later, you can take HDR to extremes with software such as Photomatix Pro, but used with a more conservative approach the images bring to the viewer a more realistic view of what our own eyes see. HDR has the ability to overcome blown-out highlights so common with indoor photos. See some HDR shots in my Residential Photography Gallery. Twilight real estate photography is popular today, especially when a property has a well designed blend of indoor and outdoor living spaces to highlight. To caputure the lifestyle this can provide, HDR Twilight comes into its own. Recently I photographed a riverside property in Benalla. Compare the afternoon shot and the same scene photographed using HDR at twilight (about 8pm in October). HDR - Photomatix Pro (Painterly 4 filter) Weird eh? Now for something really wierd! A HDR when I moved the tripod before the last exposure was finished! Steve was in Victoria to open a Youth Photo Competition in Euroa and visit Healsville for his annual Secondary School Workshops. As one of 4 judges for the Youth Photo Competition I was invited to the presentations on Thursday 11th Oct. and attended a full day workshop with Steve. It was a great experience to be involved along with about 30 other enthusiastic photographers ranging from ages of 16 to 80. It was a pretty full day but Steve entertained us with a life experience of taking photos, stories and lots of good advice re. taking your photography to a commercial level. Highly recommended. We enjoyed the venue as well, being located in the Tuscan-like surrounds of the Euroa Butter Factory in spring. Mark Jesser, one of Euroa's enterprising and up-and-coming photographers (who began the concept of the Youth Photo Competition last year) invited Steve on a tour of Gooram Falls, which he gladly accepted. Mark invited myself, a photographer friend, Chris Cope (Chris Cope Images) and Elissa Jayne (in2ishon photography) and her daughter Nikita to join him. After a slow start via Alberts we arrived at the Falls in a mixture of direct and diffused light. Ideal for photography. After consuming more than a reasonable amount of megabytes on our SD cards, we moved on to Mt Wombat where macro photography was the main focus. We saw 4 species of orchids flowering which Steve enjoyed photographing. We had our local native orchid experts (Tony and Helen) to find and verify the plants; Maroon Hoods, Mountain Greenhoods, Common Bird Orchids and the Small Spider Orchid (Caledenia para). It was great to have the opportunity to spend the day taking photos with Steve and show him some of the Strathbogies, something which he seemed to enjoy. We look forward to him returning next year to Euroa. As noted in my previous blog, I was fortunate enough to be invited on a trip to WA with the main aim to take photos. A long-time friend, Rick, caravanned to Perth with his wife Sue to visit their daughter for her 30th birthday. Sue returned to work in late July and I joined Rick for the journey home at Albany after a plane, train and bus trip from Victoria. Rick is a keen photographer and has been carting a digital Hasselblad about the country for the past few years. He concentrates mainly on landscapes, but like me, loves to find and photograph the occasional terestial orchid in the bush. Rick is developing a website with many great shots from the Hasselblad. Hopefully we will see his site on the Net soon. Check out some of my orchid photos (mainly with the Canon 100mm f2.8 macro lens), and the various landscapes with the aid of some Photomatix Pro HDR variations in my Photo Galleries. Since meeting up with Rick in Albany on the 7th August I travelled 5440km to get back home and stayed in the caravan 24 nights, along the WA coast, southern wheatbelt, Nullarbor and South Australia. Overall I kept about 6000 photos (that's a lot of film) and deleted many as well. Mac-Access is a small IT business specialising in digital photographic techniques and Apple Mac support.